We’d love your help. Let us know what’s wrong with this preview of Darkwoods by Marta Stahlfeld. A Fight for Freedom that Draws All Warriors! Darkwoods is the first book in an exciting new epic fantasy series for teens and preteens. The death of the foxes' ruling oracle, Scythe, bodes ill for the Wraith Mice around Darkwoods and their allies near and far. With the change in leadership, all sides know their uncertain relationship with the foxes will, too soon, erupt int A Fight for Freedom that Draws All Warriors! The death of the foxes' ruling oracle, Scythe, bodes ill for the Wraith Mice around Darkwoods and their allies near and far. With the change in leadership, all sides know their uncertain relationship with the foxes will, too soon, erupt into a vicious war. Possessing the ability to melt into the darkness and renowned in warfare, the Wraith Mice rally the squirrel tribes, Ranger Mice, and others to defend their territory—and their very lives. A young one among them, Princess Zuryzel understands the gravity of the situation and rises fearlessly to the challenges of the ruthless invaders. Possessing the traits of a natural leader and wise beyond her years, Zuryzel knows she must follow the difficult path before her. But can she overcome the challenges in time to defeat the hated foxes? More than a battle of good against evil, Darkwoods challenges the reader to discover the truth. Who can be trusted? Are all foxes, indeed, dastardly creatures? Who is the spy within the Wraith Mice’s midst? And, ultimately, can good ever win? To ask other readers questions about Darkwoods, please sign up. In this fantasy epic, mice, foxes, squirrels, and other land and sea creatures come alive in author Marta Stahlfeld’s debut. Darkwoods is forever changed when Scythe, the ruling oracle of the foxes, dies, causing feuds between the tribes. With the oracle gone, the animals wonder how the foxes will react, everyone agree that a bloody war will occur. The Wraith Mice, who can turn invisible, gather the squirrel, the Ranger Mice who guard the north border, the sea creatures, and the other tribes of In this fantasy epic, mice, foxes, squirrels, and other land and sea creatures come alive in author Marta Stahlfeld’s debut. Darkwoods is forever changed when Scythe, the ruling oracle of the foxes, dies, causing feuds between the tribes. 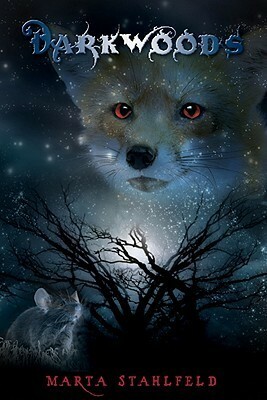 With the oracle gone, the animals wonder how the foxes will react, everyone agree that a bloody war will occur. The Wraith Mice, who can turn invisible, gather the squirrel, the Ranger Mice who guard the north border, the sea creatures, and the other tribes of Earth to help defend their land. A young wraith mouse, Princess Zuryzel, carries magical powers, and she is the next to become the a great leader, but can she overcome all odds and defeat the foxes. The Darkwoods was an interesting, fun read in the tradition of J.R.R. Tolkien’s Lord of the Rings Trilogy and the Chronicles of Narnia series by C.S. Lewis. Within reading the first chapter, you will realize that the author has a creative and unique imagination. I was hooked into the book, I instantly forgot that the characters were animals. The main character Zuryzel is a strong-willed, and every reader, young and old, can relate to her. I recommend the book to everyone. With the Oracle Scythe passing away at the beginning of the story, we learn that a battle of sides will soon be erupting among the creatures. The foxes are known for being evil and untrustworthy, battling to take away whatever they can from the others and hopefully destroying as many creatures as they can while they’re at it. The Wraith Mice are the lead characters on the side fighting for the good of what they feel is right. They stand strong in their religious beliefs and use the Bear King as t With the Oracle Scythe passing away at the beginning of the story, we learn that a battle of sides will soon be erupting among the creatures. The foxes are known for being evil and untrustworthy, battling to take away whatever they can from the others and hopefully destroying as many creatures as they can while they’re at it. The Wraith Mice are the lead characters on the side fighting for the good of what they feel is right. They stand strong in their religious beliefs and use the Bear King as their guide to find strength in taking down the enemies. The Bear King helps to bring them peace and understanding, even when times seem to get extremely tough for the Wraith Mice and their allies. This story brought back a lot of memories from my creative writing classes that I took throughout school. Marta has created a whole new world, where animals get to be the stars, showing us how they too have very similar problems and battles as we do in this world. I loved the sense of imagination that went into creating this story. It’s challenging enough to create tons of characters and battle them out in our modern world, but to add a whole new element of the characters not even being human and the world not being familiar to everyday life shows that she put a lot of work into this story. Deciding what my review “score” should be has been very challenging for me so far with this series. I have been struggling to keep up with the “who is who” while reading the book with so many characters being involved. I’m not used to reading a book with 25+ characters! With this issue, it left me struggling to get myself as emotionally involved as I would have hoped, I find myself needing that feeling of really caring about what happens to the characters in order to give the book a high review sometimes. The death of Oracle Scythe would be felt all across the land. Scythe was the one Oracle of the Darkwoods Foxes that was against warring with the other creatures in the surrounding area of the Darkwoods. With Scythe gone, the other Foxes had no more opposition to their plans of conquering all of the area, so they started their campaign to take control. Not knowing the resistance they would encounter along the way. Of all the creatures, the Wraith Mice with their magical abilities and their determ The death of Oracle Scythe would be felt all across the land. Scythe was the one Oracle of the Darkwoods Foxes that was against warring with the other creatures in the surrounding area of the Darkwoods. With Scythe gone, the other Foxes had no more opposition to their plans of conquering all of the area, so they started their campaign to take control. Not knowing the resistance they would encounter along the way. Of all the creatures, the Wraith Mice with their magical abilities and their determined Princess Zuryzel would be the toughest to get past. Along with the other talents she possessed, Princess Zuryzel has the ability to stand as a leader for all of the animals that are put in danger by the Foxes. Written by a seventeen year old, what a great accomplishment at such a young age. The use of the animals as the characters made visualizing each of them easy. Learning each of the tribes strengths and each person, or more to the point, characters special abilities made for an interesting adventure in itself. Learning their names and tribes and relations within the tribes was a bit laborious at first. Once the adventure started it was just as easy to forget who and what they were than it was to continue to struggle to remember it all. There was just so many characters, to many often unnecessary characters and sometimes to many details that seemed more of a tangent than important to the storyline. I had a difficult time getting into the story because of the amount of characters, but after I stopped trying to figure out how they all connected, it got a little better. The adventure and suspense of the story was interesting, the use of the animal tribes or clans made this one unique and the storytelling ability to put it all together was fairly well done. What a wonderfully vivid world created by author Marta Stahlfield. This is a world full of talking animals embroiled in a war for survival. Foxes, squirrels, mice, otters, and other animals are brought to life in this wonderful book that has a Narnia feel to it but is uniquely its own. With the death of the fox Oracle Scythe, the other foxes that are under the influence of the Serpent Blight have decided it is time to take over the world o I received a free copy of this book for my honest review. With the death of the fox Oracle Scythe, the other foxes that are under the influence of the Serpent Blight have decided it is time to take over the world of Darkwoods. The other animals are fighting against this. The castle of Pasadagavra seems to be their best hope. Full of characters such as Princess Zuryzel, who is a strong female character, who not only fights for her home and friends but who is also a much respected leader of the Wraith Mice. There are also many other strong female characters on both sides of this war. There's a lot going on in this book. Its full of all kinds of characters and in the begining its a bit difficult keeping it all straight. And I came to the conclusion that all the animals are about the same size, not like in this world where mice and foxes aren't the same size. There is also much more than just the war going on. There are issues that relate to our own world that are dealt with such as stereotyping and discrimination. There are also a bit of romance woven throughout the book but its not portrayed in such a way that younger readers would be lost. Throughout the book there is a religious theme woven into it like with Narnia. The Bear King and the Serpent are the opposing deities and told in such a way that younger readers can relate. This is a book unlike anything else I have ever read, and I have read a lot of books. I have never read a book where every character was an animal and at first I found it difficult to get into the story of the book. But as I read on I became fascinated by the entire world that Marta Stahlfeld has created. The creativity and imagination required to write a novel like this is extraordinary. Everything is so thought out, the personalities and traits of all the creatures, the names of the places, ev This is a book unlike anything else I have ever read, and I have read a lot of books. I have never read a book where every character was an animal and at first I found it difficult to get into the story of the book. But as I read on I became fascinated by the entire world that Marta Stahlfeld has created. The creativity and imagination required to write a novel like this is extraordinary. Everything is so thought out, the personalities and traits of all the creatures, the names of the places, everything. I became so wrapped up in the world that that fact that the characters were all animals slipped to the back of my mind. Well, since I'm the author, I guess I think its pretty good! I love the main character, Zuryzel. She is a Wraith Mouse Princess, who is learning to be a leader. As a Wraith Mouse, Zuryzel can disappear into shadows or darkness, which helps her when she goes to spy on the Darkwoods Foxes, who are trying to conquer the world. Because she has an older brother, Zuryzel does not expect to become the overall leader of the Wraith Mice, but she does have responsibility for leading some of them, includin Well, since I'm the author, I guess I think its pretty good! I love the main character, Zuryzel. She is a Wraith Mouse Princess, who is learning to be a leader. As a Wraith Mouse, Zuryzel can disappear into shadows or darkness, which helps her when she goes to spy on the Darkwoods Foxes, who are trying to conquer the world. Because she has an older brother, Zuryzel does not expect to become the overall leader of the Wraith Mice, but she does have responsibility for leading some of them, including into battle. She has an inner strength, but also knows how to show kindness to others.